Volleyball is a popular sport, but most people don’t realize that the shoes worn by volleyball players are specially designed for playing volleyball. Just as golf shoes are designed for those who play golf, choosing a good pair of golf shoes can not only affect your game, but the shoes also last longer and remain in better shape depending on how well you take care of them. 1.4 Which Should I Choose? Shoes designed for Volleyball have a sole material that is made from a gum rubber. This helps to provide excellent traction on gym floors which helps prevent both the shoe and the person from sliding on the floor. It also helps reduce the probability of injuries – especially ankle injuries. The gum rubber sole is also non-marking (meaning it will not mark the floor of the gym), therefore it helps to protect the floor of the gym. While Basketball players and those who use cross-trainer shoes are designed more for moving forward, volleyball shoes are constructed for stability and structure during lateral movement – a necessity of being a good volleyball player. The upper section of the shoe is often made of a mesh material which allows it to be both lightweight and allows air in so that the foot receives air circulations and reduces moisture – keeping the foot cooler. The midsection of a volleyball shoe is designed to support the ball of the foot. This is important as volleyball players spend most of their time on the balls of their feet. Remaining on the balls of your feet allow for lateral movements that are necessary in Volleyball. Additionally, shoes designed for volleyball provide the stability that is needed for the lateral movements. These movements put stress on the balls of the wearer’s feet and therefore the balls of the feet and the midsole are forced to absorb much of the shock. This requires that the midsole of the shoe be extremely strong, yet flexible. Most volleyball shoes use foam for to absorb the shock; however, higher end shoes use gel or air cushions. The upper part of the volleyball shoe is often made of mesh or a breathable material like mesh. This allows the shoes to be lightweight as well as allowing air to flow so that the foot can breathe. Due to the soft sole of the shoe it is not recommended that you wear the shoes outside of the volleyball court as this can lead to wearing the shoe out prematurely. If possible, remove your shoes before walking on surfaces that are not smooth like volleyball courts. Good quality shoes should last approximately one year for those who are avid players; however, they will last longer for more casual players and will not last as long without proper care. You can tell when your shoe is wearing out when the ankle support begins to get weaker and are no longer tight while playing. 1. Cushioning – this is imperative, especially if you are going to be playing volleyball daily or if you are going to be in day-long tournaments. It’s imperative in situations like these that your feet are comfortable and not in pain. If your feet are in pain, then your performance will not be optimal due to the pain in your feet. 2. Stability – because the sport of Volleyball requires that you change directions quickly, stability is an important part when choosing a shoe. If you were to wear a “regular” athletic shoe, it might not give you the support you need. This is especially true when it comes to the lateral movements that are so common in volleyball. Obviously, a good volleyball shoe will not protect you entirely from a rolled ankle, but it will provide support and will help prevent you from injuring your ankle. 3. Breathability – because we all love to talk about foot sweat. Although, sweat is good for you as it rids your body of toxins. If you think about volleyball shoes, there is mesh that is strategically placed on the shoe to allow for maximum airflow. These vents allow for the air to flow in the areas that they are needed most. Thanks to improvements in this area, makers have now incorporated moisture-wicking materials into the shoe without affecting the durability nor the weight of the shoe. This allows for optimum performance! 4. Lightweight – Volleyball shoes must walk the fine line between being lightweight and durable. All good volleyball shoes have these qualities, but certain brands value certain qualities more than others. Mizuno and Adidas work on making their shoes more lightweight and breathable. The cushioning in the forefront of this shoe is unmatched, and it hosts a great grip for indoor court play. This shoe provides adequate necessary stability while still light as a feather. However, as wonderful as the forefront cushioning is, some users complain about the cushioning through the rest of the shoe – especially the arch – and that it poorly absorbs contact with the court floor. 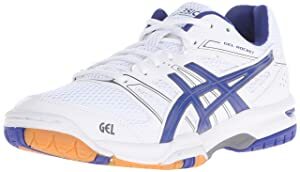 This shoe also comes with as ASICS Trusstic system which is a supportive shank provided in the outsole of ASICS running products which extends from the arch to the forefoot. 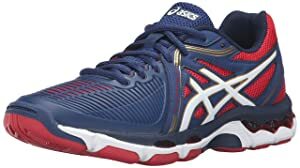 These shoes have a rubber sole that is common in volleyball shoes, they are lightweight with a mesh upper featuring synthetic overlays, and they have the cushioned footbed for which ASICS is known. The midsole is made of molded EVA and the shoe has the Court-specific Forefront GEL Cushioning Services. The shoe fits smaller than an average shoe so you may want to order a larger size or a larger half-size just to be on the safe side. The shaft measures about 2 inches from the arch. This shoe comes in a variety of colors. Although ASICS makes shoes for both men and women, this is the shoe for men. These ASICS are built with great stability and comfort, and an arch support to boot. In this shoe, you get good ankle support without the high-top fit. The grip on the bottom of the shoe is also a real attribute, as players report less sliding with this shoe than most. However, the shoe can fit a little more loosely than others, as it doesn’t seem to stay as snug as preferred. This shoe is for men, made from synthetic fabric with the rubber sole that is necessary for volleyball shoes. 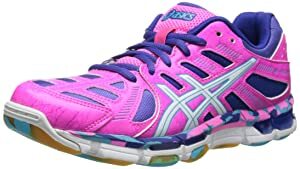 They are lace-up shoes with the ASICS logo embroidered on the tongue of the shoe. The tongue and the collar of the shoe are padded for both support and maximum comfort. These shoes have both rear-front and forefront GEL Cushioning Systems. Again, I suggest that you purchase a larger size than you normally would to be safe. These shoes come in the following colors: Navy/Silver/Electric Blue, Black/Silver, Flash Orange/Atomic Blue/Midnight. This Mizuno Men’s shoe provides stability and a lightweight, comfortable fit for long periods of play. The landing is stable and soft, and the shoe can be dependable not just for men, but for women also. It is just recommended that women order a size and a half down. There really don’t seem to be many drawbacks to this shoe, save for the lack of color options. Made by the Mizuno company, this shoe is made from a textile and synthetic material which helps to make it more lightweight. It also has a synthetic sole, a necessity for volleyball shoes so they do not leave marks on the court. The air mesh helps air to flow into the shoe which makes it more lightweight while also allowing the foot to breathe. The Wave is visible in all Mizuno shoes. The reason for the “wave” is that it allows the cushioning midsole to distribute the impact forces by spreading it out more evenly throughout the shoe. Because of this wave, the wearer’s foot does not sink into the middle of the shoe, and it helps provide support in the needed areas around the arch of the foot. This shoe, the Men’s Wave Lightning z2 Mid Volleyball Shoe, has the Parallel Wave. It is designed to work with those with neutral foot types who do not need extra support, but it also distributes the forces of impact evenly throughout the midsole of the shoe. Dynamotion fit was developed to make your shoe work with your body, almost like a second skin says Mizuno’s manufacturers. The Dynamotion fit is intended to work with your foot as it moves and stretches. The “Flex Eyelets” help to keep your heel secure while you are wearing the shoe and the “Stretch Mesh” helps to eliminate the bunching and pulling that can cause discomfort and even blisters. Dura shield toe guards are also incorporated into this shoe. The small bones of your toes, the metatarsals, help to form the framework for the arches in your feet – the one in the center and the one under the ball of each foot. These provide similar protection that steel-toed boots provide, but without the added weight. This shoe also seems to fit smaller than average, so it is suggested that you go up a size or a half-size when ordering, and it is available only in the colors of White/Black. The anti-slip lining provides a snug fit, while the hook-and-lock strap locks it down. This is by far the most stable shoe, and provides extra power when jumping and landing, without taking away from its stability. However, this shoe may not be the best buy for the money, as it is on the more expensive side. These shoes come with Boost Technology, a revolutionary cushioning tech that is relatively new to the market. The Boost Technology is made from thousands of formulated formed pellets. In fact, so many pellets are needed to create a Boost midsole that the world’s largest chemical producer in the world, BASF, is needed to produce these energy capsules. Boost is the most responsive cushioning ever. Made by the well-known Adidas company, this shoe is designed for Volleyball players. 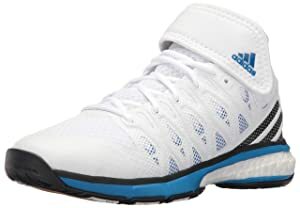 These shoes are made of textile and synthetic material as well as a synthetic sole and the rubber outsole is advertised to give you an excellent grip on the volleyball court. Made by the well-known Mizuno company, this shoe is made of synthetic material and mesh with a rubber sole. It comes only in the color of White/Black and the heel measures 1.5 inches. This shoe is well-priced and it wears well over time; the durability of this shoe is one of its strong points. 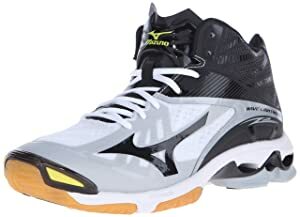 Sizing seems to be problematic with this Mizuno men’s shoe, however, as generally the shoes are too big, and a little too heavy, even though this extra weight is most likely just a byproduct of the shoe’s excellent durability. But be aware, that this shoe is a bit stiffer, as well. Another flaw of the shoe is the ventilation holes, as they don’t provide nearly enough air to escape as the result of the extra durable material. The tend to cause heat to get trapped in the shoe, rather than allow airflow as one would want. t is equipped with the Infinity Wave in the shoe’s heel which offers both premium cushioning and helps absorbs the shock that occurs during the landing that so often occurs during a volleyball game. This shoe also comes with Dynamotion which helps increase both flexibility and agility while simultaneously minimizing any instability and helping to relieve stress the foot naturally puts on typical footwear. This shoe excels with excellent traction. It holds up well over time, while the cushioning supports on impact without being too stiff. This shoe allows for more active ankles, and is great when moving front to back. The Wave does run a bit small, and is a bit more narrow, so I would suggest ordering a half size larger with this shoe. At the end of the day, this is a great shoe for indoor volleyball players, as it provides excellent comfort, grip, and support. Most of these shoes are designed by the same people that design the men’s shoes, however they are made for women. A high-quality volleyball shoe made by ASICS, this shoe is made from textiles and synthetic material and it has a rubber sole. The synthetic material and breathable open mesh help keep the shoe lightweight as well as allowing the wearer’s foot to breathe. This shoe also has GEL Technology which helps absorb the impact of the wearer hitting the ground. It is available in the following colors: Knock-Out Pink/White/Electric Blue. This is a quality Volleyball shoe. It provides awesome support, especially under the arch, and is stable and solid enough to handle a significant amount of weight. However, it too runs a bit small, and I would suggest ordering a half size larger. This shoe provides a good amount of cushioning and arch support, and are a quality purchase for the avid Volleyball player. Not too many cons have arisen since the release of this shoe, and it’s an excellent choice for young players, especially blockers. This shoe comes in combinations with silver, including black, navy, white and red. With a rubber sole and outsole, this imported, synthetic shoe comes with rearfoot and forefoot gel cushioning systems to lessen shock during impact. This shoe provides a stellar balance between bounce back and cushioning while also reducing the weight of the shoe. It encourages more natural traction on the court and is topped off with ASICS High Abrasion Rubber (AHAR) for added durability. This shoe’s upper is made of polyurethane, air mesh and synthetic leather to offer an incredible fit, and comfortable to boot. This Mizuno Women’s shoe doesn’t tend to run too wide like other brands, and provides a nice spring when jumping and landing. However, there are some concerns regarding the durability of this shoe. The heel lacks padding, and craftsmanship is put into question regarding the how quickly the shoes ware. These shoes still tend to run small, and heel grip isn’t necessarily up to par. Some users complain about their heel slipping out, or acquiring blisters on the ankle. Now, this shoe is a good one for young players, as you can get it in any color you dream. From pink to blue to neon combos, there are several combinations you can choose from. This low-cut style shoe features the parallel wave plate for lateral stability and optimal comfort, also including room for any ankle braces. This shoe is ideal for practice and games. The shoe has a rubber sole, non-marking out-sole, dynamotion fit and mizuno intercool. The good of this shoe is its comfortable fit, good arch support, and durability. It tends to break in quickly, as well, which is nice for a change. The shoe is made from textile and synthetic material with a rubber sole. The shaft measures approximately 2.25 inches from the arch, and the shoe weighs only 8.4 ounces. The new design of this shoe is seamless which allows for a lighter weight and more improved fit. This shoe will evenly disperse weight throughout the foot, while maintaining a light weight for better performance. However, the bad of this shoe is that it runs wider, again. Still this is a great volleyball shoe, and is just great overall. It comes in the colors Black/Pink, and Silver/Black, depending on what size you are ordering. These shoes run pretty true to street size. The best shoe to choose for indoor use would be one with more shock absorbency and cushioning, as well as a rubber sole to mark up the floor less, such as the ASICS Men’s GEL-Netburner Ballistic MT. An outdoor shoe would focus on mesh fabrics to allow for breathability with performance, such as the Mizuno Men’s Wave Lightning z2 Mid Volleyball Shoe. 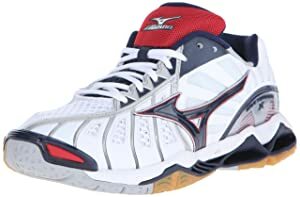 The best shoe for club volleyball players might be the Mizuno Women’s Wave Lightning Z2, because of its overall great durability, comfort, and quick break-in time. 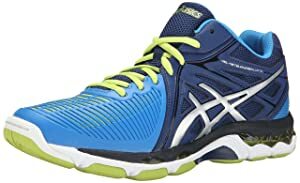 For men, the Asics Men’s GEL-Rocket 7 Volleyball Shoe, and for women, the Mizuno Women’s Wave Lightning RX3 Volleyball Shoe, because of what you get for the money with each of these shoes. These shoes are better priced and still provide quality support, traction, and durability. 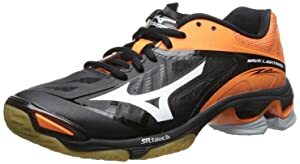 The best buy for the casual player may be the Adidas Performance, whereas, the best overall buy for more professional usage would be for men the Mizuno Men’s Wave Lightning z2 Mid Volleyball Shoe. This shoe is balanced, comfortable, doesn’t leave skids, and lasts long. 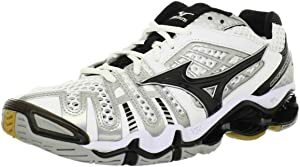 And for more professional usage by women, the Mizuno Women’s Wave Lightning RX3 Volleyball Shoe is best because, again, of its great durability, comfort, and quick break-in time. No matter how often you play or where, always consider the quality of the shoe and how much you intend to use it. Keep a balance. Don’t get shoes you cannot maintain, and don’t get shoes that don’t align with your particular use. Know your elements, and what movements you most regularly perform in the game. If you’re a spiker, get shoes with extra cushion; If you’re a setter go for comfort and agility. When choosing a volleyball shoe, always consider the location you most often play in, whether indoor or outdoor, as well as what details matter most to you when playing. Whether that is keeping dry feet, supporting the arch of the foot, keeping the weight off to jump higher, or supporting the landing with cushioning, there is a shoe for you! Nice Guide! Going to purchase Mizuno Men’s Wave Tornado 8. Loved the ASICS shoes. Will purchase this soon. 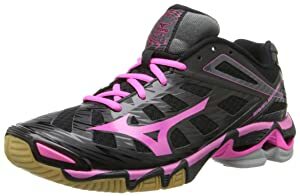 I think these are one of the best list of volleyball shoes. Thanks for crafting such an amazing lift. After reading this article I am feeling energetic.